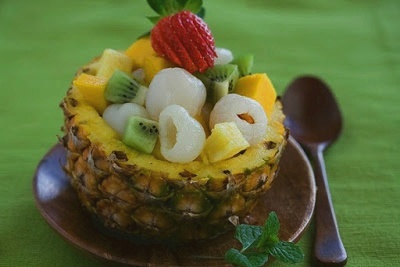 Fruit salad is incredibly easy to prepare and delicious. Enjoy! In a large bowl, combine all of the ingredients and toss. You can add the reserved lychee syrup to the fruit bowl – it’s more of a sweet water, not like a sticky syrup. In fact, any of the syrups from the longan, lychee or rambutan can be used and mixed into other fruit juices or in place of simple syrup in mixed drinks. Try it mixed with sparkling water! Below is a suggested list of fruits. Of course, this list is not set in stone. You should use whatever looks best at your store that day. Think about the colors. 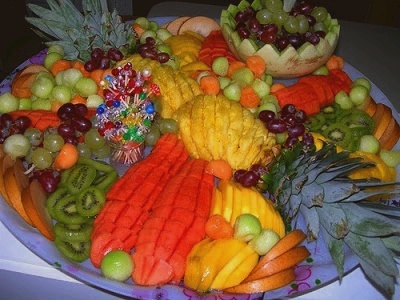 Choose fruits in a variety of colors and disperse them throughout the platter. There should be big blocks of color, with contrasting colors next to each other. Cut fruit into bite sized pieces. It looks so nice when all the fruit is roughly the same size and shape. Plus, it helps when trying to eat- it makes it easy for your guests to take what they want without worrying about cutting. Use a platter with an edge or lip. Fruit is juicy, which is one reason why it is so delicious, so it can also turn messy. Use a platter that has a tall enough edge to catch any escaping juices. This is especially important if you are transporting or carrying the platter. The last thing you want is watermelon juice dripping down your front! This also helps the fruit stay in place without sliding around. Stick to seasonal fruits. The best tasting fruits will be ones that are in season and properly ripened. In the summer go for melons, strawberries and other types of berries. In the fall try pears and apples, and in the winter feature lots of citrus. Every fruit has its own way of telling you if it’s ripe, so pay attention. There’s nothing worse than using an under ripe or overripe piece of fruit! Different types of fruit need to be cut differently. Cut apricots, peaches and plums into halves or quarters. Being sure to remove the pit. Kiwi should be sliced into rounds and peeled. Apples should be cored and cut into wedges. Cluster grapes in groups of 7 to 8 grapes on each stem. This allows guests to pick up a cluster and easily transfer it to a plate. All berries should be left whole. Strawberries should retain the green leaves atop each berry. Basically, cut fruits in the way that they will look best and are easiest to eat. A drizzle of lemon juice over the fruit will help the fruit from turning brown. Finally, group the fruit in clusters sectioning each individual fruit. This keeps a uniformed look to the platter. Going back to the feng shui principles, for the sky it may look nice to have large bunches of grapes. The earth, it would be pretty to have slices of melon, pineapple or figs . For the water, have the berries flow over the rest of the fruits. Some people like to serve the fruit with a dip, but I personally don’t think its necessary. Fruit in season needs nothing more than a creative presentation.